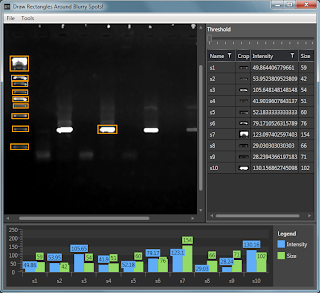 WBAnalyzer is a tiny free gel analysis tool (application, app, program... whatever) to measure the band intensity in gel electrophoresis pictures. To open an image go to File -> Open. I try to support as many image files as possible. Files that currently work are bmp, gif, png, jpg and tif. Draw rectangles around the bands you wish to analyze (drag them from top left to bottom right). To delete a rectangle / selection, select it in the list on the right and press delete (DEL). You may zoom in and out on the image using the scroll wheel on the mouse or by pressing "M" and "N" on the keyboard. To find the closest match to a band, select it in the list on the right, then go to Tools -> Find Similar. The most similar rectangle will get selected. Go ahead and download it here. Nice to know about the WbAnalyser and thanks for sharing about its operation and performance.